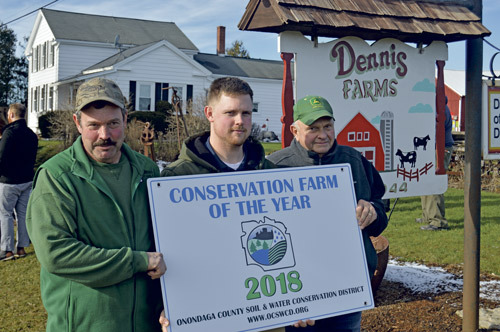 The Onondaga County Soil & Water Conservation District presented Dennis Family Farm with the 2018 “Conservation Farm of the Year” award. Three generations of the Dennis family gathered to receive the award. 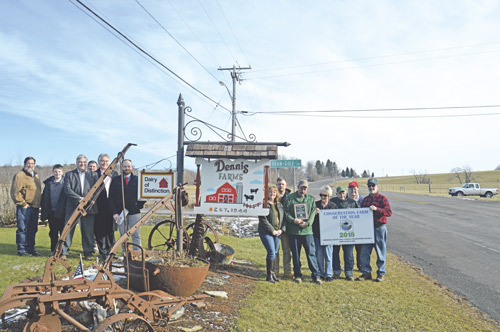 Local dignitaries were present to celebrate the farm – New York State Assemblyman Al Stirpe; representatives for Congressman John Katko; David Knapp, County Legislator and District Board member; Wayne Norris and David Coburn, also District Board members. Craig Dennis and his father Carl own and operate a 100 cow dairy and cash crop farm on 400 acres of owned and rented land situated in the Limestone Creek watershed that runs into Oneida Lake. To protect water quality, Craig and his Dad have installed many Best Management Practices through several available conservation programs. The farm has also voluntarily participated in demonstration projects that featured the use of GPS technology to precision plant corn on their farm. − 4,400 LF of exclusion fence to create a 25 foot buffer from the top of bank that keeps cows out of a tributary to Limestone Creek. To accomplish these goals the farm participates in the following conservation programs: Onondaga County Soil and Water Conservation District (OCSWCD) and the New York State Department of Agriculture and Markets “Agricultural Environmental Management” program. Local funds through the Onondaga County Agricultural Council and New York State funds through the Environmental Protection Fund, along with substantial farmer cash and in-kind contributions have made these conservation projects possible; USDA Natural Resources Conservation Service through the Environmental Quality Incentives Program; Commodity and crop protection programs through the USDA Farm Service Agency. − Carl Dennis was on the FSA Board of Directors in Onondaga County for two terms (a total of 10 years). 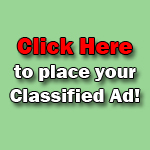 − Craig Dennis has been a member of the Delphi Falls Volunteer Fire Department for 30 years. − Craig has been on the Board of Directors of the Onondaga County SWCD since 2008 and has served as Vice Chairman of the BOD since 2010 and Chairman since 2018. He is Ex Officio member of the Onondaga County Farmland Protection BOD as Chairman of the District BOD. He also attends the County Budget Defense with the District Executive Director in September as part of his Chairman’s duties. − Craig has been known to make many overnight trips to Albany and other destinations to represent the District at important conservation meetings to discuss funding and legislation that will continue to strengthen agriculture, the environment and help to support his fellow farmer. − The Morrisville Central School (2nd and 3rd grade class / about 50 students) participates in a farm tour each spring. The students prepare questions for Mr. Dennis to answer regarding: wind energy, dairy farm operation, different types of crops to plant (grains, corn, hay). Craig’s sons Cody and Cyle also participate in this event, which has been held for the last four years. 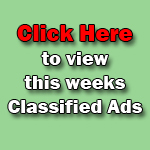 − Brownie troops from Cazenovia participates in farm tours for two years in a row. − Residents from a local elder care facility have come out to the farm for a picnic lunch and a tour; this special event has taken place for the last four consecutive years. − The farm has held many tours for the District Board of Directors and other officials from Onondaga County over the years. Most recently they hosted the Board meeting and luncheon in their shop on July 25. − During the fall, the farm is often pictured in the Syracuse Post-Standard because of the aesthetic beauty of the farmstead as a fall harvest moon sits over the farm. They give freely of their time to help their environment, community, and neighbors, and this is why the Dennis Family Farm is so deserving of the 2018 Conservation Farm of the Year award.